Enjoy COUNTRY LIVING at its finest in Braim Subdivision only 3 minutes from Camrose! You will love this 1270 sq.ft Family Friendly Bungalow situated on a peaceful 1.25-Acre lot. The main floor boasts a spacious bright and welcoming living room, a recently renovated kitchen with white cabinets and stainless steel appliances, a dining room area, two bedrooms and a 4 pce bathroom. A laundry room area and lots of closet space completes the main floor. The lower level features a large family room, three bedrooms, a 3 pce bathroom and lots of room for storage. Outside is a Piece of PARADISE that is sure to impress you! 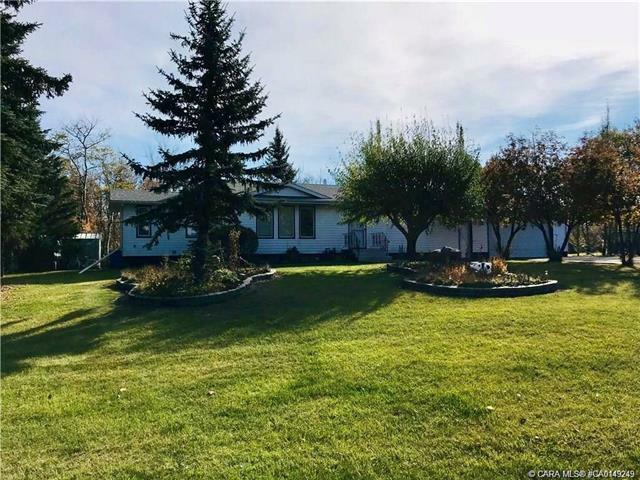 It features a well maintained and landscaped yard with an attached double car garage, a 16x42 heated work shop, a large covered screened in deck, a stone patio and cozy fire pit area, flower and garden beds, fish ponds and numerous storage rooms. Come live in the quiet of the country with the convenience of the city. This opportunity doesn’t come around often! A Must See! !